Click the Share button below to add posts you like to StumbleUpon, Technorati and other social bookmarking sites. 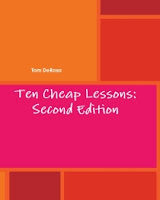 Pick up a copy of my book, Ten Cheap Lessons: Easy, Engaging Ideas for Every Secondary Classroom ($12 paperback, $6 digital). I need to tap into your collective wisdom for a moment. I love to travel, but like most people, I don't have a lot of money to do so. I've read about many interesting ways to get free or cheap travel, and I'm hoping maybe some of you out there might have some experience or information to help me out. Has anyone actually used the Educators Bed and Breakfast Travel Networks? They claim to have thousands of members across the globe, but I've never met or heard from one. There are apparently a lot of other networks focused on educators, but the whole things looks kind of shady to me. Does anyone subscribe to the Caretaker Gazette? It's basically classifieds for house-sitting. Are there other similar resources you would recommend? Finally, the most promising idea I've read about is couchsurfing. I think we all do this with people we know, but I'd love to hear from someone who tried this route. I'm interested in any other educator-related travel opportunities out there that I haven't heard of. Your help is always appreciated! During my years teaching history, I was forced to give my students a lot of awful tests for each and every unit we covered. These tests were made entirely of multiple choice questions drawn from released TAKS tests, and usually covered a wide range of unrelated topics or included the most obscure reference you could have imagined. Sometimes I wouldn't get these tests until a day or two before I was supposed to give them! I did not have the clout or guts to change the tests or throw them out yet, so in addition to fun review games, I would give my students study guides that would give them everything they needed to pass the lousy tests. My favorite study guide was a foldable commonly known as a mini-book. It's fairly easy to make (you can find directions here), and when you're done you have eight wallet-sized pages (if you use the back and front). All you need is paper and scissors. Unlined copy paper works best. Each page is small, but you should structure it to have a title (a key vocabulary word), some kind of illustration, and a one-sentence main idea. 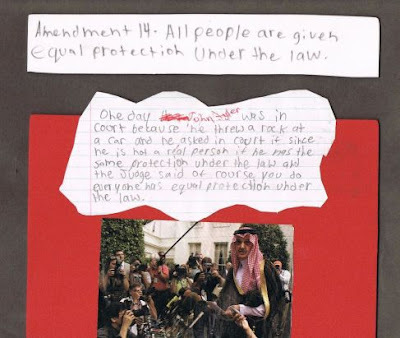 For an example, see my rough draft of a U.S. Constitution foldable. Kids like this even in high school, because it's different, it's fun to make, and it's easy to take with them. You might even let them use it on the quiz or test you're giving if they are responsible enough to have it with them on the big day. As with any good idea, you can't use it every time there's an assessment, but you can use other foldables and study guide formats to keep things fresh. In December of my second year of teaching, I was absolutely despondent. My classes were not going very well and I wasn't very happy with myself as a teacher. Desperate to create the kind of exciting, student-centered classroom I had always dreamed of having, I went to my TFA advisor and asked for guidance. With her help, I created what is still the most ambitious project I've ever asked students to do. I dressed up like a waiter and arrived Wednesday in character as head waiter of DeRosa's New Jersey Diner, where the options are endless and there's plenty of "food" (knowledge) available for any budget. 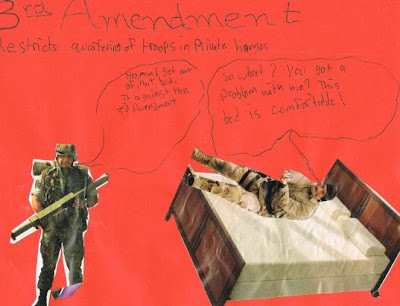 Based on what they knew coming in about what we had been doing the past week, they would pick from different sets of assignments--pictures, songs/raps, writing their own amendment, skits, surveys, letters to the editor, PSAs, etc. It is a highly differentiated project that's meant to incorporate many learning styles. After introducing the basic premise of the project, each student completed the "wallet check" diagnostic to see what they could "afford" (which types of assignments they could choose from). There's a graphic organizer and rubric included to keep them on task and show them how they will be graded. 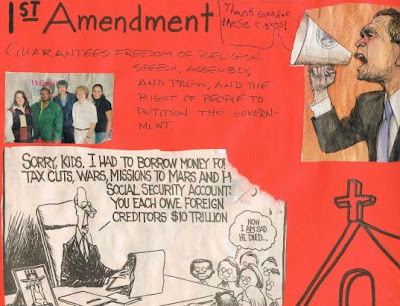 There were also puppet shows, skits, new proposed amendments and opinion pieces. Needless to say, it was exciting to witness both the creation of their projects and their presentations. I have to give a lot of credit to materials I found in my TFA curriculum and examples of projects my TFA advisor gave me. As with just about everything good I've done in the classroom, this was the product of many other people's good ideas. Of course, I comfort myself in the fact that most good teachers "beg, borrow and steal" to create their best lessons. Although the content has changed, I have always tried to review for quizzes and tests with games whenever possible. These are some of the more interesting ones I found in my records. First, two BINGO games using Steve Mashburn's template. Reform Movements BINGO - Vocabulary from the abolitionist, women's rights and temperance movements. Industrial Revolution BINGO - Major themes and key vocabulary from this era. Next, two Jeopardy style games. Colonial Jeopardy - Questions about geography, the New England and Southern colonies, and some major political ideas of the early 1700s. I made this when I was only a second year teacher, and I'm not that thrilled with it, but it's a good starting point. A list of U.S. history trivia questions. The group is split into two teams, blue and red (or Democrats and Republicans if you can pull that off without incident). In each round, a team will roll the die, take that many state cards from the deck, and then answer a trivia question. If they answer correctly, they get all of the electoral votes for those states. If not, you could give the other team the chance to answer (if you want to up the ante). Otherwise, the other team follows the same procedure. All of these games use vocabulary and wording from TAKS released tests for 8th grade U.S. History. Some question and answers don't make a whole lot of sense, but neither does much of the TAKS. Many of these terms appear again on the 11th grade TAKS, so it should be useful for those teachers as well. As always, please share your best resources in the comments or via email. As a history buff (and major), it shouldn't surprise you that one of my favorite films of all time is 1776 , an adaptation of the award-winning Broadway musical. The film covers the initial debates, writing, and eventual signing of the Declaration of Independence. It does this with sharp writing, humor, and of course, several rousing musical numbers. When I started teaching history, using this film in class as part of our study was a no-brainer. The challenge was figuring out how to fit it into one class period: The 1776 "Restored Director's Cut" DVD clocks in at 166 minutes! Besides the time considerations, there was also a lot of subplots and background on Jefferson and Adams that while interesting, wasn't something they needed to know. Explain: While Jefferson writes, Adams and Franklin convince the key state of Maryland that the army can win. Explain: Not everyone is happy, and they make plenty of changes, but the issue that will make or break independence is slavery. Explain: The final vote must be unanimous. The parts that say "Explain" are for you to take a few seconds before you skip ahead to the next scene to let them know what they might have missed. The short time allows you to set up your video equipment, complete a Do Now activity and wrap things up if you have a standard 50-55 minute period. Who drafted (wrote) the Declaration of Independence? When was the Declaration adopted (signed into law)? Who was the leader of the Continental Army? Did the Declaration of Independence abolish slavery? As a follow up project, I had students write their own Declaration of Independence. In Texas, the 8th grade U.S. History TAKS test contains a lot of names, dates and and other vocabulary. There really isn't any problem solving or higher-order thinking involved. If you can get your students to remember the key vocabulary of American history up to 1865, they'll be all set to pass the big test. One method I used to make my lessons memorable and easy to understand was having students act out short plays or skits. In February of 2005, I presented two straight days of skits about tariffs, John C. Calhoun, Daniel Webster and Henry Clay. I can vaguely remember that the first skit did not go as well as the second, because it was not written as a script. I gave my students character notecards with the most important points on them and had them improvise. Part II had a script and focused mostly on the debate over protective tariffs between Calhoun and Webster. Later, my department chair gave me a skit about the first two political parties. It was basically a Federalists vs. Anti-Federalists debate pitting Alexander Hamilton vs. Thomas Jefferson. I rewrote the skit to inject a little humor and write it in a conversational tone that my students would understand better. Finally, as a review heading into the TAKS, I basically took a list of important figures we were reviewing (George Washington, Lewis and Clark, Eli Whitney, Robert Fulton, Andrew Jackson, James Monroe and Henry David Thoreau) and created a talk show where they explained their significance. It isn't my best work, but it was certainly better than the alternative (boring notetaking). Take a sheet protector and run twine between the top and bottom holes, long enough so that it will hang at chest level. Slip the paper with the character's name into the sheet protector. Write it with a big permanent marker or use a really big font and landscape mode in your favorite word processor. History Week, Day 1: Before I Taught Math, I Taught U.S. History! That's right: I was not always a math teacher. In fact, I didn't even major in mathematics or a related field. I graduated from Rutgers University in 2003 with a degree in history and a minor in political science. 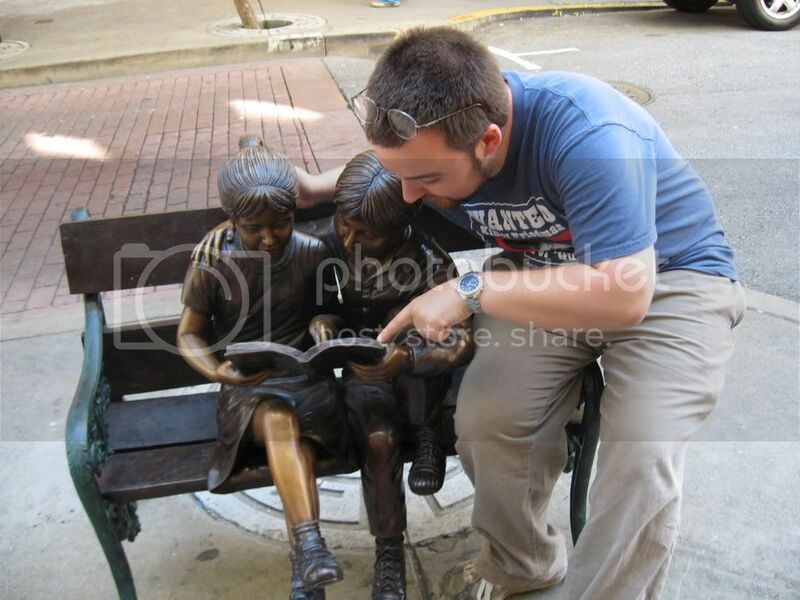 I took my love and knowledge of the social sciences with me into Teach for America, and I was lucky enough to get a job teaching what I had studied. My first teaching job, my first real job of any kind really, was teaching 8th grade U.S. History at a small school in Rio Grande City, TX. I didn't really know what I was doing that first year. I knew the content, of course, and I could explain it in a way that my students understood. I was pretty awful at classroom management as well as making my lessons anything but teacher-centered. Of course, I didn't usually know what I was supposed to be teaching until the day before or day of a lesson, and my “curriculum” consisted of pages of definitions of TAKS terms. If I was lucky it would already be on a transparency, saving me the time and challenge of having the text burned onto one using what I think was a ditto machine. I learned very quickly that many people considered pages of notes to copy and/or worksheets of released TAKS questions to be a “lesson”. I should probably forgive myself for being not knowing any better, but I went along with what I was told, and gave my students whatever I was given. 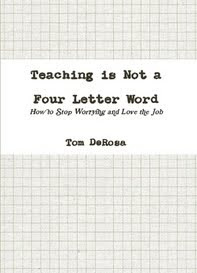 Over time, with the support of mentors like my friend Dave (an excellent young teacher who worked at the same school) I learned that it was okay to change things, throw stuff out, and do what was best for my students. In my first year, this only really happened in the spring semester, and only in small increments. I would modify a chapter test I was given that contained an unending stream of released test questions, or changing a list of definitions into a graphic organizer. My classes did relatively well on the TAKS, well enough so that my department chair expressed her gratitude by telling me that heading into the test, she didn't think we were going to do well at all. Over the summer, I went back and looked at everything I had been given, all of the notes and definitions my students had labored over. I thought about all of the boring activities and worksheets I had done in unsuccessful attempts to make things stick. I took nearly every page and rewrote it completely, with a single question in my mind: “How can I make this interesting and memorable for my students?” Not surprisingly, things went much better that second year, and my students did even better on the big test. This is, of course, only part of the story, the part necessary to preface the U.S. History (to 1865) content I'm going to share this week. These ideas are my best work, and many of my best math lessons have roots in my two years teaching history. This carnival, which deals with everything about personal finance and saving money, features my recent post Are You a Teacherpreneur? and much more. Click through to read! As I continue my work with new teachers here in the Rio Grande Valley, I've been getting a lot of practical questions that most first year teachers around the globe are probably asking as well. A common theme I was asked about is "What supplies do I need to buy?" Hopefully, many of these items will last you for years because you will be well-supplied by your campus. If you know you'll need a class set of items, such as highlighters or rulers, you should probably get those yourself while back to school sales are still going on. You have to assume that your school, like most schools, has a limited budget and might not accommodate your request (however valid). ***WARNING: These items tend to grow legs and disappear faster than you can say, "Welcome back to school!" You must keep them in a place where students can't get to them (preferably locked), and watch over them carefully when students are using them legitimately. Tomorrow: The SECRET Teacher Supply List, the essentials "they" won't tell you about! ...because no one has submitted one! There's still time, though. More info here. I realized the other day that while I had written about getting ready for back to school several times over the years, I had not collected those ideas in one place. I also know that there have been many, many new readers since these were originally posted over the last two years. First Day of School: Sample Student Surveys, Parent Letters and More -There are two versions of the surveys and letters to help you write your own. First Day of School: Mini-Lesson on Calculating a Tip - For those of you who want to get down to business on day one, or at least are thinking about alternatives to icebreakers. Updated First Day Student Survey - This is the most recent one I used. Notice that I don't ask a lot of the typical questions any more; I really pared it down to only the things I really needed to know to teach them well. Questions to Ask Yourself To Be Ready for the First Day of School - If you've covered all of these, you're all set! Just remember that there are a lot of new ideas that have been posted this month to check out as well! I was reading an article on Learn Me Good about things to do before school starts again, and the last part about going to see the doctor got me thinking about other non-teaching related things that you should try to do before school starts. Car maintenance. If you don't do it now, who knows how long it will be until you take a day off to do it or find an open Saturday. Most teachers I know, myself included, rarely take a day off before Thanksgiving. This includes anything you need to do at the dealer (that's a whole day affair, guaranteed), fixing windshield cracks, new tires, inspections, oil changes, or any routine maintenance that will keep your car running smoothly for as long as possible. Figure out what you're going to do about coffee, breakfast, and lunch. You'll save money, eat healthier, and get to spend your time eating at a reasonable pace if you plan ahead. You can make meals at home ahead of time or buy stuff you can eat on the go from the supermarket (instead of a convenience store or coffee shop). And please, if you're a morning coffee junkie like me, get something so you can make it at home! Make appointments for your kids. You know how frustrating it is when your students miss school days for doctors, dentists and other appointments? Don't be that parent. Schedule them now while there's still after school and weekend spots open. Make any non-doctor, non-auto related appointments for yourself. Maybe you need to see a lawyer, the loan officer at the bank or get measured and fitted for a dress or suit. Even if you can't get yourself in the office before school starts, you should be able to get a spot for September that works around your schedule. Contact family and friends you've been meaning to get back in touch with. I am so guilty of this that it hurts to write this sentence. I get so wrapped up in school stuff and am available so few hours of the day that I can never find a good time to call all of the people I care so deeply about. Weeks become months, and months can become the entire school year before you realize what's happened. Maybe you can also figure out some times to travel or for those people to visit you as well. Organize (or participate in) one last big bash of the summer. Whether it's a low-key night of board games, a beach party or backyard cookout, gather the friends and family that are close by and take advantage of the last responsibility-free time you'll have until next summer. You deserve it, and believe me, you need it! I'm sure if you're willing to be honest with yourself, you know exactly what things you always think about doing but forget about once the school year really gets going. Whatever it is, do it now! The Best Ways to Find Other Classes For Joint Online Projects [@Larry Ferlazzo's Websites of the Day] - This a great way to get your kids invested in just about any topic. Climate Change Action Projects Database - Non-profit organization Facing the Future has created a database of service learning projects (focused on sustainability issues) that complement their free curriculum resources. I'm a big proponent of trying to work service learning into the classroom, and I think this would be an interesting project for an enterprising teacher to try out. WNBA's Fast Break to Reading Program - I just got an email about this interesting summer reading program. There's still time to get involved, and if your kids are interested in the WNBA, it's a great way to get them reading (which is a great way to get them back into "school mode"). There's more information and resources on the FBTR wiki. What Matters Most [@Teacher in a Strange Land] - Something to think about before you get caught up in all the minutae of back to school. I did a lot of research on probability lesson plans this past year, but I really didn't like a lot of what I found. I found that most of them they just weren't any fun, which in my mind seems to go hand in hand with probability. So here's two new resources I found, an old idea worth revisiting, and advice about setting up your students for success on this topic. Mathwire.com One-Die Toss Activities - This site has a bunch of dice-based probability games. I recommend Pig, Skunk and the Cheerios Experiment (which really should be named after a more unhealthy, toy-promoting cereal), as all of them were successful in class. Design Your Own Game Project [Word doc] - Students design their own carnival-style game, calculate the probabilities involved and reflect on what they learned and created. It's simple to explain but will push your students to really think about probability in this kind of context. The document includes a rubric as well. My students really enjoyed doing this, both in Algebra I & II. If you have the time and resources, you could even have a "Carnival Day" where students would play each other's games. This game was found online and the link had been dead for a long time, but I found a copy in my records. Probability Using "Deal or No Deal" - This is arguably my most popular lesson plan idea ever, but I actually want to make sure you read the opening coin-flipping activity I used before starting the game. Even if you don't use the game itself, you should absolutely open any probability unit with that fun activity. Probability questions involving playing cards are one of the most common asked on standardized testing in both Massachusetts and Texas (and we all know how much influence the latter has, for better or worse). Your students need to be ready for them, and I think it will make other probability questions easier as well. You can ask simple questions as a review and check to make sure they're simplifying each fraction, then move on to asking them about independent and dependent events. Your textbook and supplemental material is probably full of these types of questions as well. Finally, some students will need an actual deck of cards in front of them to understand the questions, which is another good reason to make sure you always have one in your classroom! With school right around the corner, it's time for teachers to begin gathering lesson plans and other materials for the classroom. Fortunately, there are lots of different sites around the web that can help. Here are 25 places that offer free printables, worksheets, and lesson plans. Thinkfinity - This website from the Verizon Foundation offers free lesson plans in addition to a lesson plan search engine that pulls results from all over the web. PBS Teachers - PBS Teachers is a great website for educators who need lesson plans, curriculum ideas, and materials for classroom activities. The Apple - The Apple is a social network for teachers. The site provides an excellent lesson plan section where teachers can search for lesson plans or submit a lesson online. We the Teachers - This online community for teachers provides a lesson plan search engine and a place for teachers to meet and share classroom activities and curriculum ideas online. TeachersRecess - The File Cabinet at TeachersRecess is another great site for teachers to find and share lesson plans and worksheets. Tapped In - The online education community is a place for teachers to collaborate and share lesson plans. HotChalk - HotChalk has a wide range of free resources for teachers. One particularly valuable resource is the Lesson Plans Page which host more than 3,000 free lesson plans for K-12 educators. Teacher Focus - This site's Lesson Plan Library provides lesson plans for a wide range of subjects, including art, music, health, P.E., science, math, language arts, and literature. The New York Times Daily Lesson Plan - This NYT website features a daily lesson plan to help engage students in the news. Lesson Plan Central - Lesson Plan Central provides thousands of free worksheets, printables, and lesson plans for teachers. Other resources include classroom clip art, PowerPoint templates, and web quests. The Lesson Plan Library - Discovery Education's Lesson Plan Library offers free lesson plans for K-12 teachers. Most plans are designed to accompany Discovery VHS and DVD titles. TeAchnology - This free online teacher resource is one of the most comprehensive on the web. The site offers over 30,000 free lesson plans in addition to 7,000+ free printable worksheets. Read Write Think - This NCTE website offers free standards-based lesson plans and classroom activities for K-12 teachers. Math Fact Cafe - Math teachers will love this site which offers free math worksheets for elementary students. English Banana - The English Banana offers hundreds of free printable worksheets for English teachers. The site also provides resources for drama teachers. VH1 Music Studio Lesson Plans - VH1 Music Studio provides dozens of free lesson plans for music teachers. Crayola Lesson Plans - Crayola provides hundreds of standards-based lesson plans and lesson plan ideas for K-12 teachers. Subject areas include language arts, social studies, science, math, and visual arts. School Express - This education site offers more than 15,000 free printables and worksheets for the classroom. School Express also provides quiz makers, puzzle makers, and other helpful tools. abcteach - Although abcteach does offer special materials to paid members, the site also provides thousands or worksheets that can be downloaded and printed for free. Kids.gov - This free government website is a good place to find lesson plans, classroom activities, and other teaching aids for a wide range of subjects. Tlsbooks.com - Tlsbooks.com provides free printable worksheets for home and school use. Most of the worksheets are designed for K-5 teachers, but there are also worksheets available for preschool educators. SoftSchools.com - This online resource offers printable math, phonics, and grammar worksheets for elementary and middle school teachers. Awesome Library - The Awesome Library hosts nearly 40,000 free (and reviewed) education resources for teachers of every subject. Family Education - This site has a Printables Center with thousands of free educational printables and activities for students of all ages. Guest post from education writer Karen Schweitzer. Karen is the About.com Guide to Business School. She also writes for OnlineDegreePrograms.org. Lifehacker has a map of tax-free shopping deals across the country this month. Many states are having their tax holidays this weekend only, so click through to see if you can take advantage. For those of your holding off on your back to school shopping, this Thursday 8/13 I'm sharing a guide called The Only Five Things Your High School Student Needs to Go Back to School. Stay tuned! I'm happy to report that Week 28 is already set for this coming Monday, but there are many weeks left in the year-long 52 Teachers, 52 Lessons project. Since this month's theme is "Back to School", this is a good time to get your advice in. Find out how to be a part of this project here. You can also read all of the entries so far by clicking the "52 teachers 52 lessons" tag. Thank you! GreenQuest is a personal Web-based energy dashboard that enables individuals to track the energy for their home or business for free. Teachers can use GreenQuest in the classroom and also offer it to their community, leading them to a more efficient, less costly, and cleaner future. More than 150 school districts have already signed up for FREE GreenQuest web sites. GreenQuest includes valuable energy benchmarks, carbon footprint, weather analysis, performance charts…even a free ENERGY STAR interface for the business owners in a community! It’s an easy-to-use, informative teaching device…a FREE instructional tool with real-world application across multiple subject areas. Since school’s out, sign up as a Basic Sponsor before August 31 and the setup fee will be waived. And, as Basic Sponsorship doesn’t cost anything—ever—so you and your community can use GreenQuest for free—forever. Get in while school and the setup fee are still out! Click here for more about the GreenQuest School's Out promotion. There's a demo site and lots of answers to questions you might have. I'd also check out the Loudoun County (Virginia) school district's website that details everything they've been doing with GreenQuest as a catalyst. Imagine a science or math teacher being able to access this online and what they could do with it in the classroom! We talk about this stuff all the time, of course, but sometimes you just gotta show your students the real-life data to really get them thinking about it. Have you tried this software? Do you have ideas for possible uses in the classroom? If so, please share your thoughts in the comments! CONTEST: Free Drawing for $250 in Teacher Supplies - Jim Deeds of American Classroom Supply emailed me this great opportunity to win some much-needed funding for your classroom. No purchase necessary--just sign up for their email list. The drawing is on 8/20, so hurry! Most lucrative college majors [@CNNMoney via Consumerist] - Post this on your math (or science) classroom wall before day one, and make reference to it as soon as school starts! Myth-Busting: What's Gender Got to Do with It? [@Math Mama Writes] - Fighting gender stereotypes about math (and science) are one of the battles you'll need to fight. Read this for help debunking these ideas when they come up this year. The Best Sources For Advice On Using Flip Video Cameras [@Larry Ferlazzo's Websites of the Day] - The Flip, if you haven't heard about it, is exactly the kind of technology we should be getting into students' hands as soon as possible. This should help you either plan for using it or introduce it to those of you that are wondering what all the fuss is about. If You Make Only One Change This Year... RELAX!!!!!! [@So You Want to Teach?] - Joel may have written this last year, but some of us need annual reminders (if not more)! Stopped traveling for the most part; I saw my family about the same amount of times that I did when I lived roughly 2000 miles away, and despite all logic, I didn't travel to visit my friends in New York the entire time I lived in Boston! I can honestly say I was happy with all of these changes (except for the last one, for which I was recently able to make amends) and plan on sticking to them. Doing all of this really made me think about what other teachers and educators might be sacrificing to make their paycheck go farther. What's really been intriguing me, however, is the other side of this issue: making money beyond our regular teacher pay. I think I've become what some have termed a teacherpreneur and I feel like I'm not alone. Throughout my career, I've taken advantage of nearly every extra pay position I was offered. How many of these have you done? I've also seen people turn their colleagues into customers for a side business--everything from passing out business cards to one enterprising teacher who sold tamales door-to-door (classroom doors, that is). Yet when I think about this idea of teacherpreneurship, I'm wondering about how many of us start our own business on the side in order to make more money. I think there are two distinct camps. The first group applies their teaching/education knowledge directly: private tutoring, consulting, teaching college courses, creating and selling all types of teacher resources. The second group has a hobby or skill unrelated to the classroom that they turn into extra money. Personally, when I created this blog I was not expecting to make any money. Two years later, I make a few dollars a month from advertising and referrals. I wrote Ten Cheap Lessons last year and have just about broke even on that. Now I find myself doing things like taking $0.05 jobs on Amazon's Mechanical Turk service and trying to parlay my blogging abilities into freelance writing gigs on other topics. If we assume most teachers take extra jobs in and around school and/or become an entrepreneur in their spare time, the big question that looms over all of this for me is: Why do we have to do this? Why are we not paid enough that we don't have to? I'm really interested in your feedback on the many questions surrounding this issue, especially with a new school year on the horizon. Am I right? Dead wrong? Let me know in the comments. You're Reading One of the "100 Best Blogs for Teachers of the Future"
Clear View Education, a site specializing in online degrees and colleges, just posted a list of the 100 Best Blogs for Teachers of the Future. I Want to Teach Forever is listed at #28. This is a great time of year to seek out some blogs that will inspire you or provide great lesson ideas throughout the year. Many of my favorite blogs are on the list, as well as a wealth of other resources I urge you to check out. In the Advanced Math & Logic elective I co-taught this spring, we talked about a lot of math concepts that often never seem to fit into the rigid state standards for Algebra, Geometry and beyond. Yet after finding so many great resources and ideas, I think any of these activities could and should be done in your regular high school math classrooms. Some of them will be good at getting students interested when things seem boring, some would make great extra credit or challenge problems for your brightest students, and most of them have a place in your classroom no matter what. This first part is all about topology. One of the first concepts we explored was this simple theorem. First, we did this simple Map Coloring activity. Then, I challenged students to try to see if they could follow the Four Color Theorem by filling in this blank U.S. Map. These activities could help hook students into a unit about proofs. These are puzzles where you take various shapes and combine them into one larger shape (similar to tangrams). There's a lot of these puzzles in Professor Stewart's Cabinet of Mathematical Curiosities by Ian Stewart, the brilliant book that helped inspire these ideas. I think something like this would be a great way to kick off the year in Geometry, or a challenging project for a student who needs it. There's six different types of online, Java-based games utilizing these concepts here, but the one that we played in class was the maze where you direct a mouse to cheese. The kids really enjoyed these. If you can find printable versions of this, in a book or otherwise, please let me know (after months of searching, I still can't find the site I was able to print from when I used this in class). The Konigsburg Bridge problem (there's more good stuff about that one here) is included here among others. These should be printed out for student use. Click here for Part 2, which features resources for other discrete math topics.